oatmeal lace design: thursday- etsy day! The 'thursday purseday' bag I wanted to feature today sold out on etsy (boo!!) and I couldn't think of a back up on the spot. Oops. 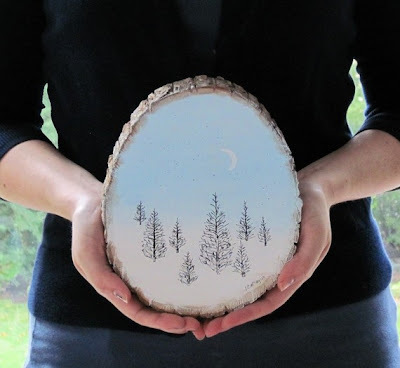 Anywho- I was looking through my list of favorites today and since it is the winter/holiday season I had to show you all this gorgeous 'Christmas Tree Forest' painting done on a slice of a real tree trunk. (Paintings on a wooden plauqe? sold!) I so want this to hang on the wall right now! Do you have any favorite etsy items you'd like me to feature? I'm going to start making sure I do a weekly post on etsy finds.